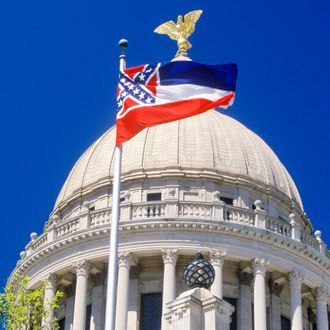 Ole Miss coach Hugh Freeze and Mississippi State coach Dan Mullen were among the high-profile names to sign a full-page newspaper ad this weekend calling for the removal of the Confederate emblem from the Mississippi state flag. Celebrities like Jimmy Buffet, Morgan Freeman, and John Grisham also signed the letter, which appeared in the Jackson Clarion-Ledger, but with football season approaching, the inclusion of the rival SEC coaches drew extra attention to the cause. Freeze, a Mississippi native, had spoken out against the current state flag earlier this year, telling reporters during SEC media days last month that “I think it’s time that we move in a different direction.” At the time, Mullen had stopped short of calling for the flag to be changed, avoiding the question by talking instead about the diversity of the Mississippi State campus.